Cite page (MLA): "Project Bibliography." In Livingstone's Final Manuscripts (1865-1873). Megan Ward and Adrian S. Wisnicki, dirs. Livingstone Online. Adrian S. Wisnicki and Megan Ward, dirs. University of Maryland Libraries, 2018. Web. http://livingstoneonline.org/uuid/node/3ce886fd-7e91-4774-9611-7088ff515114. This page presents a bibliography of the primary works cited in the critical prose of our edition of Livingstone's final manuscripts (1865-73). The bibliography builds on and extends the bibliography developed for the Livingstone Spectral Imaging Project, so users are directed to that bibliography for the full context of the works cited here. Anon. 1872. Review of Henry M. Stanley's How I Found Livingstone. Illustrated London News 20:Cover, 485. NJ.677. National Library of Scotland, Edinburgh, Scotland. Anon. 1874. Review of David Livingstone's Last Journals. Illustrated London News 64:381 (cover), 392, 401, 417. NJ.677. National Library of Scotland, Edinburgh, Scotland. Anon. 1900. Lantern Slides of the Life, Adventures, and Work of David Livingstone. A13. Smithsonian Institution. Libraries. Joseph F. Cullman 3rd Library of Natural History, Washington D.C.
Livingstone, David. 1866a. Field Diary II. 4 Apr.-14 May 1866. 1124. David Livingstone Centre, Blantyre, Scotland. Livingstone, David. 1866b. Field Diary III. 14 May-30 June 1866. 1125. David Livingstone Centre, Blantyre, Scotland. Livingstone, David. 1866c. Field Diary IV. 1 July-5 Sept. 1866. 1142. David Livingstone Centre, Blantyre, Scotland. Livingstone, David. 1866d. Field Diary V. 5 Sept.-23 Oct. 1866. 1126. David Livingstone Centre, Blantyre, Scotland. Livingstone, David. 1866e. Field Diary VI. 24 Oct.-23 Dec. 1866. 1127. David Livingstone Centre, Blantyre, Scotland. Livingstone, David. 1866f. Field Diary VII. 26 Dec. 1866-1 Mar. 1867. 1128. David Livingstone Centre, Blantyre, Scotland. Livingstone, David. 1866-67. Map of Rovuma River and Lake Nyasa. 1866-67. MS. 10744. National Library of Scotland, Edinburgh, Scotland. Livingstone, David. 1867a. Field Diary VIII. 4 Mar.-19 May 1867. MS. Dep. 343. National Library of Scotland, Edinburgh, Scotland. Not included in this edition. Livingstone, David. 1867b. Field Diary IX. 20 May-7 Sept. 1867. MS. Dep. 343. National Library of Scotland, Edinburgh, Scotland. Not included in this edition. Livingstone, David. 1867c. Field Diary X. 9 Sept. 1867-2 Jan. 1868. 1129. David Livingstone Centre, Blantyre, Scotland. Not included in this edition. Livingstone, David. 1868a. Field Diary XI. 1 Jan.-12 June 1868. MS. Dep. 343. National Library of Scotland, Edinburgh, Scotland. Not included in this edition. Livingstone, David. 1868b. Field Diary XII. 14 Apr.-10 Nov. 1868. On display. Livingstone Museum, Livingstone, Zambia. Not included in this edition. Livingstone, David. 1869. Field Diary XIII. 28 June 1869-25 Feb. 1871. MS. Dep. 343. National Library of Scotland, Edinburgh, Scotland. Not included in this edition. Livingstone, David. 1870-73a. 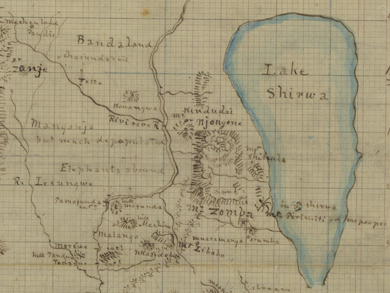 Map of Southern End of Lake Nyasa. 1870s. 150. David Livingstone Centre, Blantyre, Scotland. Livingstone, David. 1870-73b. Map of Southern End of Lake Tanganyika. 1870s. 808a. David Livingstone Centre, Blantyre, Scotland. Livingstone, David. 1872g. Field Diary XV. 7 July-1 Dec. 1872. 1131. David Livingstone Centre, Blantyre, Scotland. Livingstone, David. 1872i. Journal ["Second" Unyanyembe Journal]. 14-24 August 1872. 963. David Livingstone Centre, Blantyre, Scotland. Livingstone, David. 1872j. Letter to Henry M. Stanley. 14 March 1872. 769. David Livingstone Centre, Blantyre, Scotland. Murchison, Roderick Impey. 1869-70. "Presentation of the Royal Awards (At the Anniversary Meeting, May 23rd, 1870)." Proceedings of the Royal Geographical Society 14: 279-332. Murray, John IV. 1874. Estimate Book: Expected Costs of Publishing David Livingstone's Last Journals. MS. 42722, 187. National Library of Scotland, Edinburgh, Scotland. Murray, John IV. 1875a. Trade Advert for Mr. Murray's New Works, Now Ready: Dr. Livingstone's Last Journals in Central Africa, Quarterly Review, 138:1. NRR (Quarterly Review). National Library of Scotland, Edinburgh, Scotland. Murray, John IV. 1875b. Trade Advert for Dr. Livingstone's Last Journals. Quarterly Review 138:14. NRR (Quarterly Review). National Library of Scotland, Edinburgh, Scotland. Stanley, Henry M. 1874. "The Life and Labours of David Livingstone." Supplement to the Graphic, 393-407. 25 Apr. 1874. GIVB. 2/53. National Library of Scotland, Edinburgh, Scotland. Wakelin, John. 1925. David Livingstone: A Study in Creative Personality. The Livingstone Talking Music Film. Page & Thomas Ltd. Acc. 12927/324. National Library of Scotland, Edinburgh, Scotland.